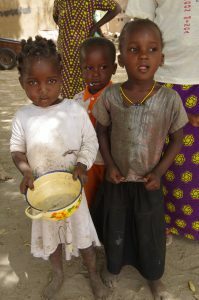 The following is an account by Judy Gray following her visit of APDC projects in Burkino Faso. APDC is funded by World Neighbours Canada. It’s 8AM and we are underway – off this morning, first to Gbersaaga, to view the rice fields being prepared so they can be planted this June and then on to Ganyhela – a new village where we’ll observe an information session on nutrition, in concert with a cooking demonstration and meal sharing. We are familiar with the road that eventually will reach Niger: the potholes, the donkey carts, the apparently dead but really just dormant trees lining the highway, the villagers on bicycles, the goats crossing the road and more – all magically misty due to the dust in the air – and know that we’ll reach Gbersaaga in about thirty minutes. Time to reflect on what we’re seeing, but not relax totally – who can do that when the chauffeur must slow and swerve dramatically every few minutes to avoid those deep pits! And then – suddenly we’ve arrived: off in the distance through the ghostly trees, we spy the furrows in the flat landscape and we are driving across red dirt to the “lowland” – though it looks just as flat as the land around it to me – to the fields being prepared for rice planting. We arrived before 9AM and already there were about 25 villagers hard at work; really, not surprising as the sun’s heat was evident the moment we stepped from the truck. Hard, rock hard “soil” is slowly and mercilessly being chipped into smaller chunks in order to prepare partitions – or small “walls” that will keep the water inside the enclosure once the rice is planted. To begin with, the entire area of 3 hectares is being “fenced in” with these walls or “diguettes” as they are called; and after that, the bas-fond rice field will be divided into much smaller individualized plots, with a wall between each section. Sweat pours off the villagers as they swing a pick axe high into the air, before bringing it down into this parched and hardened “soil”. As the pick meets the soil, the dust floats up and the land is broken into a few chunks. Repeat, repeat, repeat – same spot – several times, in order to break the ground into small enough chunks that can then be bashed with a shovel and the chunks piled by hand to create an 18 inch high, 20 inch wide wall – the work reminds me of my childhood when I’d build a moat around a sand castle! More than twice that energy is required to achieve this result! .The villagers have split up into small groups of about 8 and each group is working on one of the individual diguettes. 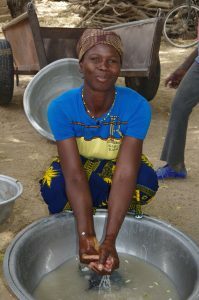 And it is certainly not just men who are out toiling in the heat of sun: young women, women with babes on their back, and elders – as one person tires, another takes over; while still others work behind placing the chunks into the correct spots to produce a wall that will trap that water once the rains begin. A sense of urgency is present – the walls must be built before the rainy season which will arrive, hopefully by late May; and between early March and May, the days will get hotter and hotter as the temperatures will rise eventually to near 50C! We learned that the three hectare bas-fond belongs to one family of Gbersaaga, and while that family will be given several of the individual parcels, the remainder will be allocated to 100 families – all of whom will help, and have helped with this back-breaking preparatory work. Once the work is completed and all the diguettes have been constructed, someone from State agriculture department will come to the village and assign the parcels – the village leadership committee will provide information about those who should receive a parcel with priority given to the poorest households in the community and often women, with no husband, but women who are able to work that land. We also learned that one parcel of land ( about 20 metres square) will yield about 100 kg of rice. 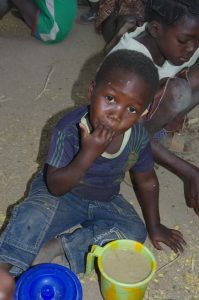 A small start, but one more way to increase food security and diversify a family’s diet. The rice field observation completed, we were back in the truck and on the highway for another 15 minutes to reach the village of Ganyhela. 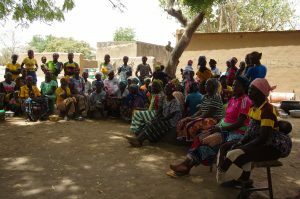 This village joined the project just over a year ago, and in spite of limited duration of this village’s involvement, the villagers seem to have wholeheartedly embraced their inclusion in the APDC project. About 80 women, young children and babes were already gathered under the ubiquitous “big shade tree” – we always meet under a tree, as the temperature is probably almost ten degrees lower than the mad dogs and Englishmen full sun temperature. 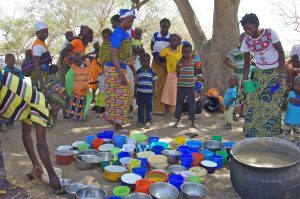 Food preparations had begun around 7AM, with the guidance of the two APDC field workers, Hortense and Diaboado. It takes time to gather enough wood, set a fire, and get the enormous cauldron and the required quantity of water heated Two “dishes” are being prepared today, as usua l – one, a bouillie or porridge for children between the ages of 6 and 11 months – their introduction to “solid” food and then a “repas solide” or stew, for everyone else: toddlers and young children, pregnant and nursing mothers ( virtually every female in the group! ). 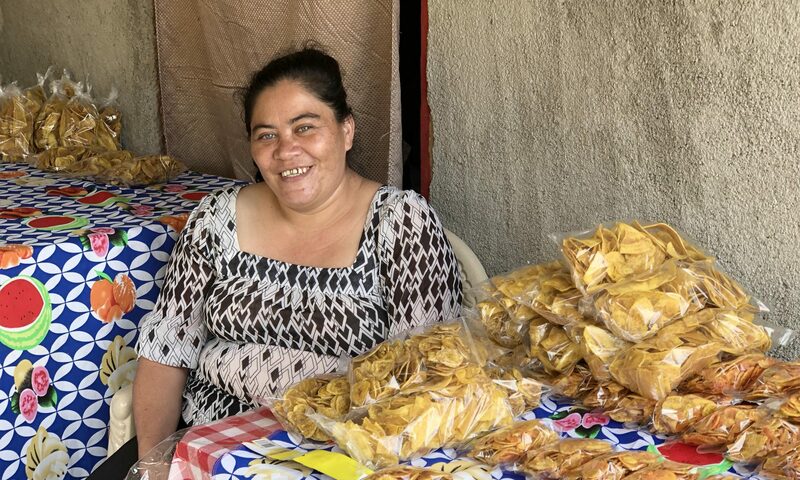 Emphasis is placed on including a food from each of the important food groups: a cereal, a protein, and a fruit or vegetable – and explained to the villagers as “an element for energy, an element for growth, and one to provide needed vitamins”. 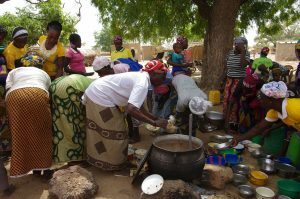 Once the preparation of the two meals is well underway, and the grain ingredient needs time to simmer, the women gather to listen to the instructional part of the demonstration: Diaboado explains the reason and importance for each food group and , with the aid of very primitive visuals, shows examples of which local foods are part of each food group and may be used in a “meal” preparation. One must remember that at least 80% of these women are illiterate, and must absorb and retain this information orally; no mean feat for women who have never had any formal schooling and another reason for repeating the sessions more than once. 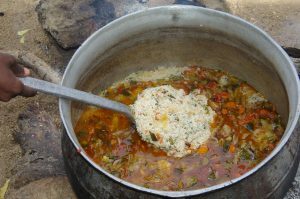 Today’s bouillie includes rice (the cereal), ground nuts (ground peanuts), dried powdered fish, and niebe ( navy beans ) – (the protein), and tamarind (the fruit ) while the “repas solide” or stew includes tomatoes, onions, chopped cabbage and eggplant (vitamins), powdered dried fish and niebe (protein) and rice (grain) along with a handful of salt. This meal’s preparation was multi- stepped: first the chopped tomatoes, onions, and cabbage were gently fried and put aside; then water was added along with big chunks of aubergine and cabbage – these were cooked until soft and removed also; next the chopped fried vegetables and uncooked rice and navy beans along with lots of water were cooked and simmered until the rice and beans softened. During the cooking time, the information session with questions took place. 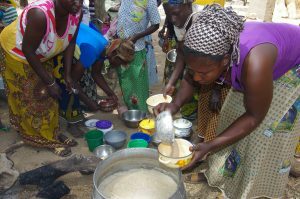 Finally it’s time to eat: more women and children drift in and the bowls are placed on the ground. 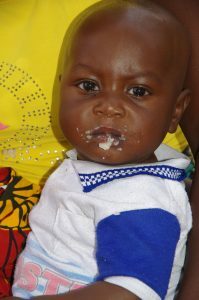 The bouillie for the very young served is served first and time allowed for mothers to help the babes mouth the thick soup – time needed for the bouillie to cool as it’s still very hot and a few cries escape in the beginning! 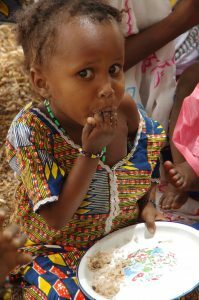 Fingers dipped in our communal bowl as we must try everything too, and after I’ve sampled the soup, I’m off to grab photos of the babes – many licking the soup from their mum’s fingers. I noticed a number of children older than 11 months who are also sampling the bouillie; seated on the ground, finger dipped repeatedly into a small plastic bowl and then licked with gusto as the soup is enjoyed. I forgot to say that handwashing hygiene is also part of the session and large pans of water with plenty of soap are available and children and mums are wash hands well before eating. 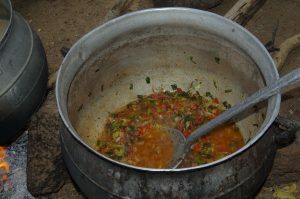 The bouillie largely finished, it’s time for the repas solide to be served. 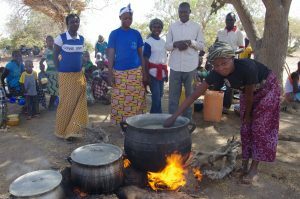 A flurry of activity as each woman places her bowl on the ground beside the huge cauldron: one woman serves the rice-niebe mixture and then places a couple of chunks of the cooked cabbage and aubergine into the bowl. It’s suddenly quiet under the big tree as all are sampling and enjoying the food. WE eat from the large bowl provided – one bowl for the six of us – hoping and praying as I eat that any vicious bugs will have been killed during the cooking and acknowledging that this is, indeed, very tasty!!! 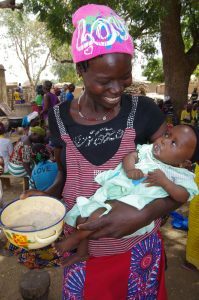 Time is taken to enjoy the food – no-one rushes off back home; bellies replete the women continue to chat, help a toddler eat or nurse a baby once again. As I again wander around the assembled groups, I notice that the huge cauldron of stew and the one of bouillie are being scarped within an inch of their lives – not a scrap of food remains, and one woman is watching carefully to make sure no-one returns for a second serving! There is really just enough for each person to have only one! 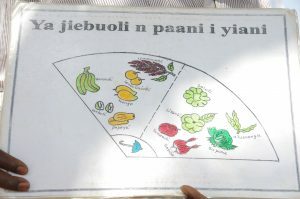 We witnessed this instructional session and accompanying food preparation in three different villages over the course of our visit: each time different foods were used, but always attention paid to the inclusion of a food from each group, with emphasis on the use of locally available items! Probably the most interesting and inspiring sessions we witnessed during our stay in Fada.